Guardiola fielded his team in a 3-3-3-1 formation against Milan, reminiscent of shapes seen at the Allianz last season as well as in his final campaign at Barcelona. Bayern’s starting formation against AC Milan. Ex-Stuttgart Sven Ulreich, one of Bayern’s numerous signings over the summer, started in the Bavarian goal behind a back three consisting of Juan Bernat, Jerome Boateng and Rafinha. Immediately ahead of the defence was another signing from Stuttgart – Joshua Kimmich. The young pivot had played for Leipzig following playing youth football previously for Stuttgart, in this deal consisted a buy-back option and which Stuttgart exploited to then move him on towards Bayern. Hojbjerg supported the left building game slightly ahead of him alongside Sebastian Rode on the right. Vidal started the game at the 10 position and possessed a very flexible role off of the ball, frequently dropping into the space below to aid in connections and combinations – a serious issue for Bayern’s Super Cup defeat to Wolfsburg. Lahm started on the right flank and played a versatile role where he made variable movements throughout 20 minutes he spent there until the unfortunate injury to Kimmich. Meanwhile on the other flank, the 4th new signing of this starting lineup threatened throughout the first half. Costa’s explosiveness was one of Bayern’s biggest threats during the 45 minutes he was on the field as he was the constant target for isolating passes to create 1v1 situations. Over the summer, one of a few excellent signings by Bayern was the acquisition of the wide forward Douglas Costa from Shakhtar. The Brazilian is a strong dribbler and has excellent physical features which are key in his attacking style. Not least of which is his explosiveness which can at times immediately allow him to dominate his full-back in the one-against-one moments which Bayern so often seek to create. Juego de Posicion, something well discussed here on Spielverlagerung, is somewhat based around creating superiority whether it be positional, quantitative or qualitative. 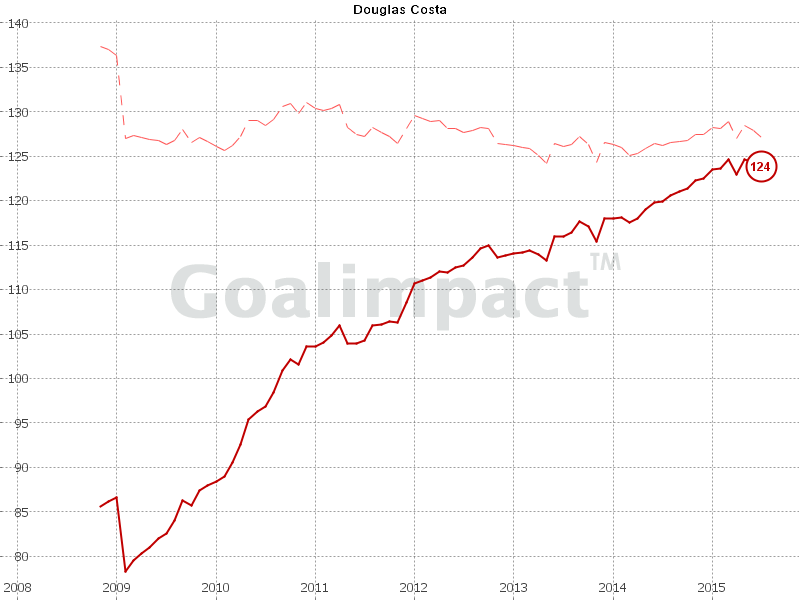 In the case of Douglas Costa individually, Guardiola possesses an excellent dribbler who can take advantage of his superior physical and technical ability over his opposition. To emphasise and exploit this factor, the team is structure to cultivate a situation which will be best designed to emphasise Costa’s abilities; in this case his dribbling and physical qualities. Building down the right to exploit Costa’s under-loaded left side. In the above hypothetical scene, Bayern have developed possession down the right flank with their midfield shifting over in particular so that they have 5 midfielders within a small space, forcing the opposition to react and shift their own midfield towards Bayern’s right. After a combination Bayern break the opposition’s access to provide a temporary window in which Kimmich can seek out an incisive pass. With this opportunity, Kimmich picks out Costa on the under-protected side of the opposition’s defence after they moved towards towards the ball to stop an overload from occurring. The switch of play creates a 1v1 situation which can best emphasise Costa’s qualitative superiority over the full-back who is without the defensive support of his teammates. The superior field of view from the half-space. Also notice how Costa is in the half-space and not the wing. If he was positioned nearer the touchline, the pass required would be too long in length and duration, giving AC Milan the time to readjust their shape and prepare a press to improve their defensive access. 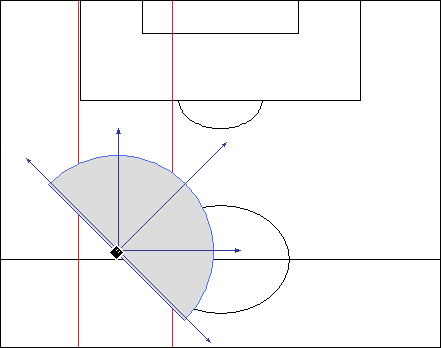 Aside from this logistical issue, the half-space provides multiple attacking benefits from an improved field of view (which supports the ball-carriers ability to make effective diagonal passes) to better access to other strategically-valuable areas on the pitch. A key feature of switching play is diagonality. This is primarily in the passing as it is the most effective for many purposes but not least the switching of possession from one flank to another, which it supports much better than horizontal passes and (more obviously) vertical passes. The reason for its general superiority over horizontal and vertical passes is for the effect each pass brings. Horizontal passes switch the play but create no increase in pressure on the goal – at the beginning and end of a horizontal pass from half-space to half-space, strategically the ball is in a very similar position. When compared to diagonal passes, it is clear to see the disadvantage as diagonal passes not only switch the play but gain space and increase the pressure on the opposition’s goal. On the other hand, vertical passes increase the pressure on the goal but provide no horizontal change, meaning that the opposition can adjust more easily to the new ball position. Aside from this, the receiver is usually with his back to the opposition goal meaning that he is in a bad position upon gaining the ball and if he’s under defensive pressure, he may be unable to turn and can only manage a wall pass back to the original player. A goal-oriented analysis on the angles of passing. Another factor is that diagonal passes can best transfer the ball into a more threatening position than the original. Although vertical passes are the best way to gain space and threaten the goal, for the majority of time they are directed into spaces which are best controlled by the opposition. On the other hand, horizontal passes work well to circulate the ball into a less well-covered area but as I previously stated, don’t gain space to pressure the opposition goal. Diagonal passes however not only gain space but nearly always circulate the ball into a position which is less well-controlled by the defending team. The diagonal pass creates the most threatening situation. Another man key in Bayern’s diagonality is Jerome Boateng. His passing ability is already key for Bayern’s possession game and has been a key factor in their build-up especially for recent years. In moments of switching possession, his passing ability is key as it can allow him to effectively and quickly move the ball towards the opposite side for the likes of Costa. In the opening 20 minutes against AC Milan this was a repeated pattern of Bayern as they looked to isolate the opposition full-back with their new Brazilian winger. The diagonality also provides yet another point in the argument against Xabi Alonso’s involvement at pivot. The Spaniard’s positioning often causes issues in blocking passing lanes to other teammates and frequently disrupting the spacing of the positional structure by moving too close to his teammates. Because of this, he often indirectly isolates teammates and causes issues not only in the balance of the shape but the circulation of the ball too. On the other hand, new signing Kimmich possesses much better positioning intelligence than his Spanish teammate and in his albeit short performance at 6, improved the spacing considerably. 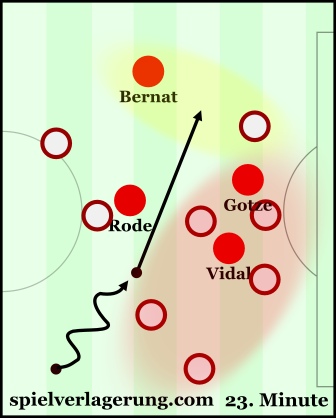 The build-up to the first goal of the three Bayern scored. Although in this case it was Douglas Costa assisting, diagonality showed its benefits for Bernat’s opening goal of the game. 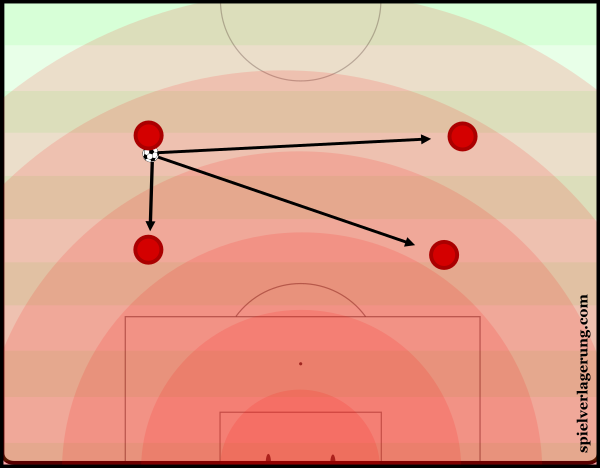 As the Brazilian was dribbling in a run from well inside his own half, he cut off the direct defensive influence of 4 Milan defenders through a diagonal dribble from the right half-space. This dribble also prevented the opposition’s access temporarily so that he could place this diagonal pass into Bernat’s run. Had the pass been horizontal, no pressure would’ve been placed on the opposition’s goal, the opposition’s defence themselves would not have had to continue retreating and could instead force better pressure on the ball as the momentum of the attack reduced. By the time the ball had reached Bernat, there were 7 AC Milan defenders around Costa’s space whilst Bernat was against just the single defender. The diagonal movement of the ball bypassed the 5 defenders. 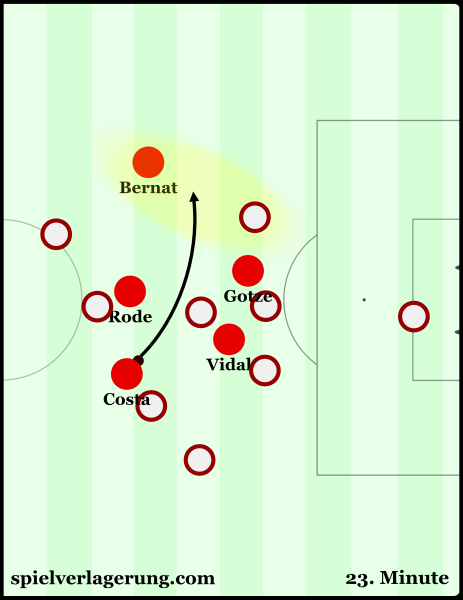 The collective diagonal movement of the ball through initially dribbling and then passing worked to bypass the majority of the opposition’s defence (the 5 highlighted in red) to then isolate Bernat against the full-back. Diagonality is one of the many reasons as to why Messi’s dribbling is so effective. Especially when he has been on the right for Barcelona, he frequently makes diagonal dribbles towards the centre of the pitch. Not only does he quickly move the ball into a threatening position but he will frequently bypass the large bulk of the opposition’s defence by dribbling around them. He is famed for beating multiple players in a dribble but in these situations he may beat 2 players but bypass 6 or 7. The other major signing for Bayern over the summer was the acquisition of Arturo Vidal of Chile and previously Juventus. His support in actions such as balancing and supporting connections in a complex system can be potentially invaluable for Guardiola and his future role was hinted at in this performance. During Bayern’s possession game the Chilean was very flexible out of possession and would frequently drop into spaces, primarily around the right half-space near Lahm. 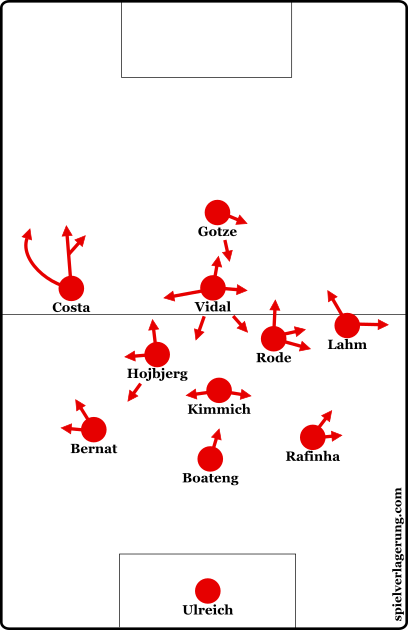 A considerable number of these movements were for balancing purposes with the inside orientation of Lahm at times during the first 20 minutes whilst this was perhaps less so when Costa moved to the right wing, as the Brazilian had a more linear orientation than the German who moved to 6. 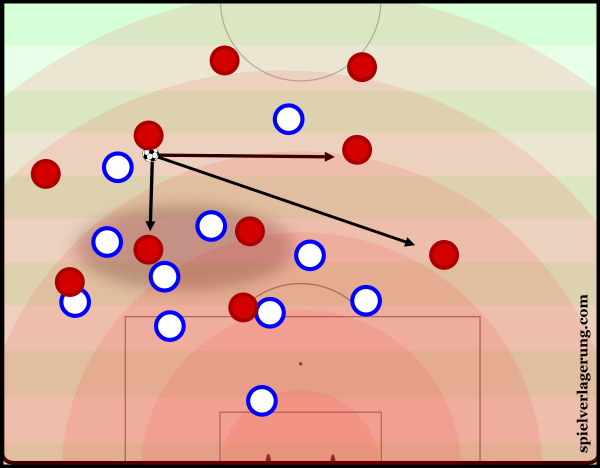 Alternatively he dropped into smaller scenes to provide valuable support in connections across the structure, often moving in to create a key 4th or 5th connection to the ball-carrier to make sure possession didn’t become isolated. The connections in their possession game was a significant issue as Guardiola’s team lost on penalties to Wolfsburg in the Super Cup. With a lack of presence in the centre as well as a lack of positional support from Alonso, Bayern’s structure was poor and led to players being isolated in wide areas which Wolfsburg could easily defend against once they improved from their own issues in the opening stages of the game. 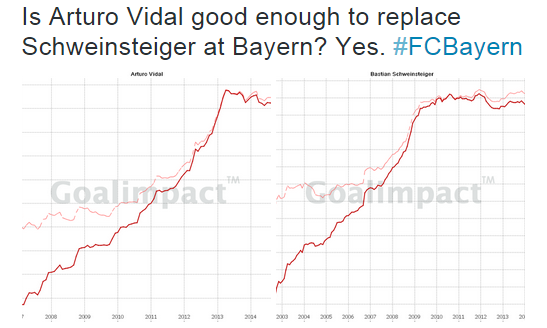 Out of possession, Vidal played an important role in supporting Gotze in the press and often provided an immediate second wave as well as cutting off horizontal pass options when directly alongside the German World champion. His movement was likewise flexible without the ball and could be seen dropping into the half-spaces to support the likes of Rode and Hojbjerg in their pressing. With the presence of Costa and Bernat too, he could add a third or fourth number which would not only aid the press but the retention of possession on the second ball as well as the counter-attack following. Despite playing only 45 minutes each, both Douglas Costa and Arturo Vidal have hinted at how their vital qualities will fit into Bayern’s system for the 2015/2016 season. Joshua Kimmich too made a good performance before his unfortunate injury in the 20th minute and could be a strong alternative for Alonso at the number 6 position. Thank you for the article. I especially enjoyed the part about diagonality (and its effects succinctly shown in those radar like graphics) which is something that is in general too often ignored as a possible choice usually leading to predictable wing play instead. Worth a read even for people not fans of Bayern specifically.